Things change, but yet they don’t. A Christian group called Columbia Christians For Life sent out the alert. God punished New Orleans with a killer fetus seeking revenge for the abortion clinics in the area. Albeit laughable, yet an eerie reminder of just how far we’ve not come in nearly 300 years. 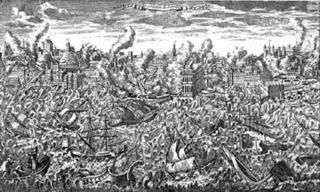 No less strange is the response to the Lisbon earthquake of 1755 that crumbled the town and killed a 100,000 souls. The nutty religous leaders at that time decided “that the burning of a few people alive by a slow fire, and with great ceremony, is an infallible preventive of earthquakes.” (Voltaire Candide) The ensuing battle of philosophic differences fueled events that sparked revolutions all over the place such as the French and American. Nature certainly does have a way of stirring things up in the ant hill. And for those who view abortion as a violent act I ask, “Why is a collection of cells with the potential for life (regardless of the mother’s ability to care for that life) more important than the 43 MILLION CHILDREN ALIVE who suffer daily in abject poverty, 6 MILLION of which die each year before the age of five. People who don’t support birth control and safe abortion are part of the problem. Shame! Connie, Just a personal note to you. We are distant relatives from Ohio. My grandmother was Flora Stevan’s, sister to your grandmother. My mother’s name was Wanda ( Linson ) Gillen. While looking through our family records, and learning more of you, I felt a sense of closeness with all you have gone through losing your husband to the dreadful disease, cancer. My point is only to let you know, as a distant cousin, I care! I am not trying to persuade you to change your thinking of Godly people, only to share, faith is not easy to understand. I am a Christian, but we need to live it, you have had a whirl-wind life, and ups and downs, but sounds as though you are close to your children. That’s great! Hi Dianne, Nice to meet you, too. I don’t think being a Christian means people can’t have birth control or think logically. But thank you for your caring thoughts regarding my husband and children. Flora (Stephens) and Lewis Linson certainly had their share of tragedies. I love Flora’s smiling face in pictures and wish I’d had a chance to meet her. So many of my mom’s family were dead by the time I was born. Oh, and Dianne, Flora was my mother’s older sister…..